Following up on last week’s post covering my most important lessons for attracting your webinar audience, let’s now pivot and focus on how to keep them engaged once they show up live as an attendee at your webinar. Next week, my final post will cover how to convert your audiences to become your customers. Develop and Audience Profile That Aligns With Your Topic and Value Proposition. Consider External Thought Leaders as Speakers vs. Internal Company Experts. Gather and Mine Actionable Live Cycle Intelligence. In my previous post, I also mentioned that two of the five topics below each led to a million dollar sale, and asked you to guess which ones. The answers are 4 and 5. Now let’s get into more specifics on how you can keep your audience engaged once they show up for your webinar. While this might sound obvious, it’s not too many. The webinar invitation is your contract with your audience, and keeping it will go a long way to establish your credibility and convey that you respect your audience and their time. Audiences can be very forgiving about many things, but they will quickly bail from your webinar if you don’t hold up your end of the bargain, and if they sense a sales pitch, they will start to drop off like flies. Here’s an example of how a recent webinar sponsored by a software provider serving automotive dealerships was able to engage their audience by delivering on their invitation’s promise. The webinar, titled Conquest Case Study: How Performance Toyota Increased new Vehicle Gross Profits and Sales, promised to address a real pain point for automobile dealers by sharing a case study delivered by the customer who was also the dealer principal. On the webinar, the dealer principal shared how he was able to increase their average gross profits, reduce price discounts as the sales desk by more than 50%, and find the pricing “sweet spot” in his market for every new vehicle to maximize gross profit. The dealer principal did such a credible and authentic job of covering these points, it inspired many in the audience to want to learn more and resulted in the webinar sponsor collecting over 180 leads and closing 30 new deals, with over $400,000 in annual incremental revenue. Which of your speakers will address the problem statement? In the above webinar example there were two speakers. One was an internal executive, and the other was an external speaker (dealer principal). In this case, it made sense for the internal executive to set the stage and discuss the challenges dealerships are facing for new vehicle margins, market based pricing, and minimizing discounts. Will the content be based on a case study, such as the example above by Performance Toyota, or will it be more of a tutorial on “how to” accomplish and overcome a vexing challenge, or will it be an update on changes around compliance or standards that will impact those in the audience? Once you factor in the above, you have 30–35 minutes of talk time to be divided by your speakers. If you have two speakers, that’s about 15 minutes each. 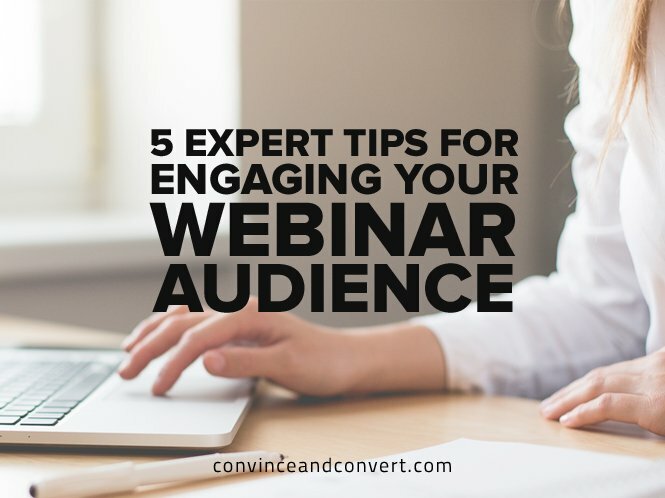 The operative word is having your speaker(s) “connect” with your audience, which motivates attendees to lean in and want to learn more about your webinar topic. Keep in mind that folks who register and attend your webinar live are already interested in hearing what you have to offer. Remember they are on a journey to become better educated on how they can overcome a pain point or achieve better outcomes. Your speakers are experts, and the best way for them to share their expertise is not to create slides and visuals that are text-heavy with a lot of facts, but to have an authentic conversation with the audience that allows them to be more conversational than simply reading bullets on a slide allows. It’s perfectly fine to be enthusiastic, but don’t sell. The audience wants to hear how you overcame a vexing challenge, what your options were, what was implemented, and what the demonstrable outcomes were. In the Performance Toyota webinar example, the dealer principal established his authenticity out of the gate by explaining his background: before getting into the car business, he was a trained engineer, which helped him realize that there had to be a better way than his current approach of developing homegrown pricing. His “pain” was exacerbated by having to use a time consuming spreadsheet which he called a “beast.” He then did his research and came upon an off-the-shelf software solution that he sensed would help get better business outcomes. Finally, he discussed how by implementing this solution, he achieved more pricing clarity, improved his gross margins by an average of $300 per car, and created greater customer satisfaction. The takeaway is that he focused on outcomes, not product features. He was able to weave in the commercial name of the solution into the discussion and have it be a logical part of his case study. None of these outcomes above happened in a vacuum. Read on for the other webinar components that were also critical to being able to deliver such a compelling case study. It’s as important to coach your speakers to inspire their audience as it is to ensure they connect and are clearly heard. Audio is the Achilles heel of all events, and this is even more true in a virtual event such as a webinar. (highlight to tweet) If the audience can’t clearly hear what is being said, they will drift and start to multitask, and if it gets really bad, they will drop off. Optimize the audio input choices for your favorite webinar platform. Know which devices work best and which devices to avoid. Perform sound checks with each speaker to make sure that the audience is treated to great sound on webinar day. You must know where your speakers will be on webinar day. If at all possible, make sure that you’ve done a sound check on that location beforehand. Many webinar speakers travel often. Whether they are in Beijing or Baltimore, it’s important to know their environment in advance so you can have a Plan B in case they run into last minute issues, such as a slow internet connection. Not all audio devices are created equally. Most audio input devices are telephone landline handsets or headsets, but if your webinar hosting platform provides VoIP, and you have a strong internet connection with minimum upload/download speeds of 5 Megabits/second, using a USB headset or a standalone microphone mounted on a scissor boom can really make your speakers sound like a broadcaster. We do not recommend using speaker phones, since they create a distance between the speaker and the audience. Mobile phones or any devices that are wireless can also be spotty and run the risk of running out of battery. If you really want to make your webinar a great and memorable audience event, it’s imperative that you budget time to get all of the speakers together to attend practice sessions, which we at WebAttract call table reads and dress rehearsals. Plan and schedule these meetings two to three weeks before you go live, preferably, either in person or virtually. Be sure to allocate at least an hour or more to each session. I know some of you are thinking it would be hard to get your speakers to attend these sessions, but I’ve found that speakers really want to do a great job, no matter how busy or experienced they are. If they feel you really have their best interests in mind to make their portion the best it can be, they will gladly attend and participate with enough notice. Even the most experienced presenters who speak for a living benefit from practicing their portions, especially during a timed read while the other speakers are on the line. A side benefit if having the speakers participate in table reads and dress rehearsals is that they create a bond and a level of comfort. All speakers are on the same page for delivering their messages. Your audience will appreciate this, too. Make adjustments and tweaks, such as making sure you use multiple voices between speakers or adding a skilled moderator. This ensures your webinar is more conversational by creating a dialogue as opposed to a monologue. Perform sound checks to test and optimize webinar audio. Ensure the slides are visually appealing and not too busy, trying to communicate too many points. Create online polls that encourage the attendees to weigh in. Check if the pacing is comfortable. Determine if the timing leaves enough time for a healthy amount of Q&A. Ask yourself: Are we telling a great story? Would this webinar grab my attention and make me want to learn more? Dress rehearsals help you make sure you’ve covered all of your bases, and the investment of everyone’s time will pay off handsomely in helping to meet your commercial outcomes while adding value to your audience. The most important thing to remember is to have fun and not worry about sounding scripted, as this is about connection, not perfection. In my final post, we’ll complete the arc from Attracting and Engaging to, finally, Converting. We’ll discuss what to do after the webinar is over, so you can begin to convert your audience into becoming your customers.